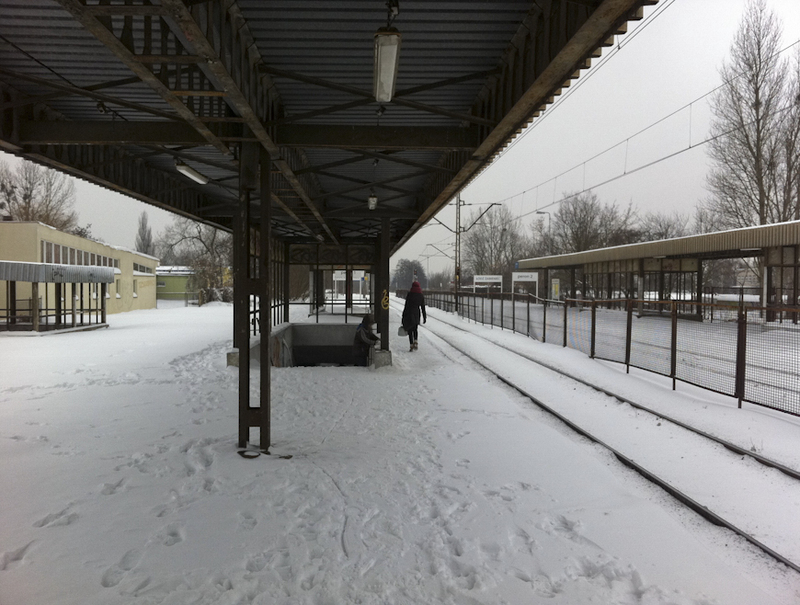 While all long distance passenger trains stop at Lodz Zabieniec, passenger facilities here are minimal. The original booking booking hall is now a private restaurant and night club, the toilet block has been converted to a newsagent shop. There are no shelters for passengers. Photo BTWT. 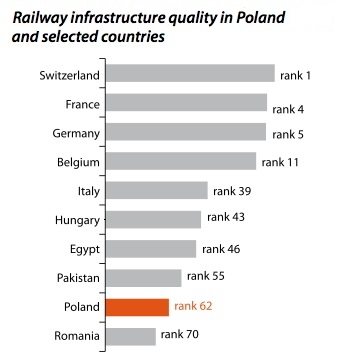 Poland’s railways are in a mess. While many large cities in Europe have already experienced ‘peak car’ effects and in some countries, such as Great Britain, rail passenger numbers are booming as never before, Poles are deserting their rail passenger services in droves. According to EU-commissioned customer satisfaction surveys, Poles are amongst the most dissatisfied railway passengers in Europe. Poland’s rail freight sector is also in a desperate state, with crippling track access charges and a decaying infrastructure little better than that of Romania. Freight trains creep along at average speeds more appropriate to the time of Stephenson’s Rocket. Not surprisingly, the effect has been a catastrophic decrease in rail freight’s market share. In 2001, 33% of all freight carried went by rail, by 2011 rail freight’s market share had dwindled to 18%. While total freight carried in the 10 years 2001-2011 increased by 105%, the amount carried by rail only increased by 8%. 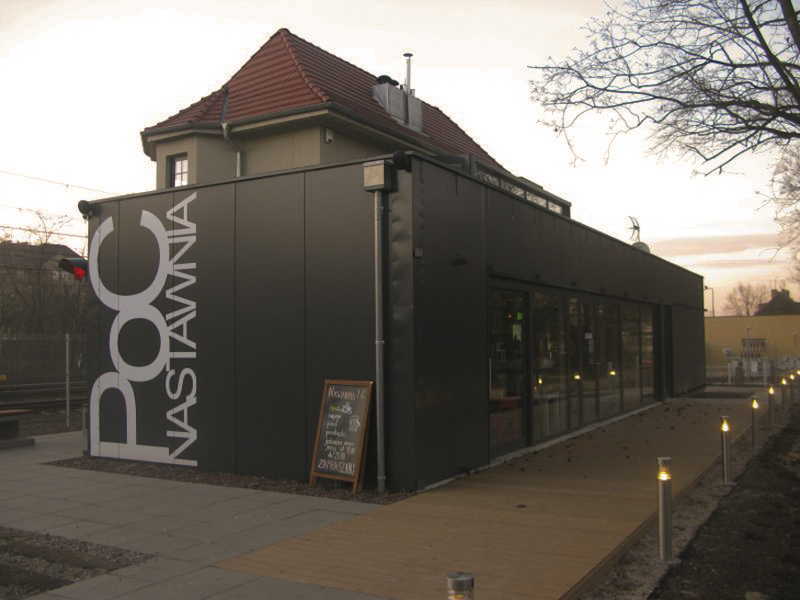 Intermodal freight, a booming business in the rest of Europe, remains a niche market in Poland. Rail’s share of this fledgling market is 3.9%, one tenth of that of Belgium and one quarter of the EU average. 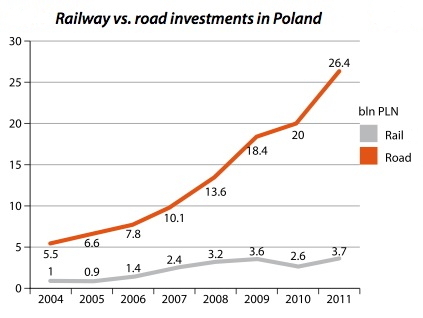 Poland’s railways have become the Cinderella of Europe and the neglect of nation’s railways effects everyone. Slow and unreliable commuter trains affect worker productivity. Newspaper headlines scream that PKP IC trains have been infected by vicious bugs. Lack of information about cross-country train services and poor ticketing arrangements effect tourism. During last year’s Euro 2012 football championships there was a flood of enquiries about Poland’s train services on Internet forums such as Trip Adviser. Polish fans answered with one voice. Go by bus, go by plane, go any way you like, but don’t go by train. Road accidents are amongst the highest in Europe. Fatalities on Polish roads per million inhabitants are three times higher than in the UK. But high track access charges, many times higher than European norms, mean that heavy, poorly maintained, long-distance lorries creeping through Polish towns belching carcinogens contribute to the incidence of lung disease and cancer and drive up health-care costs. Paradoxically, perhaps the worst effected is the ordinary motorist whose car is prematurely aged by travelling on pot-holed roads damaged by excessive lorry traffic. Few people understand that the damage caused to a road surface varies as the fourth power of the axle weight passing over it and that every tax payer subsidises the ‘track access charges’ of the HGVs operated by the road haulage companies. Everybody in Poland picks up the bill for the neglect of the country’s railways. The solution would appear to be simple – to allocate a greater share of the national budget to railway infrastructure investment and maintenance and to reduce track access charges to average EU levels. But nothing in Poland is ever simple. Prior to its entry to the EU in 2004, Poland was already subject to the tight fiscal targets and external supervision entailed in an IMF adjustment programme. Dubbed the Balcerowicz Plan, this not only entailed a tight squeeze on government spending but also set specific targets regarding issues such as the number of employees employed on Polish state railways. A strategic agreement was drawn up with the World Bank whereby the Polish railway system would be divorced from the state and regarded for all intents and purposes as a commercial enterprise. In return the World Bank provided PKP with a 101 million USD credit facility to cover the costs of restructuring. Meanwhile Poland was negotiating to enter the EU. European Commission officials have their own ideas as to how to reform Europe’s railways. Competition is seen as the key and officials have been pushing for a separation of infrastructure management from train operation. The railway infrastructure could, and should be subsidised by the state, in the same manner as the road network. Train operating companies should operate free of state subsidy, and as far as freight and international services are concerned should be subject to free competition. The World Bank and EU requirements for the management of Poland’s railways do not sit easily together. The result of both of these frameworks applied simultaneously did not accelerate the reform process of Poland’s railways, but rather the reverse. Any serious attempt by the Ministry of Finance to provide financial support to Poland’s railways could have the the potential to threaten the credibility of the złoty and damage the economy as a whole. 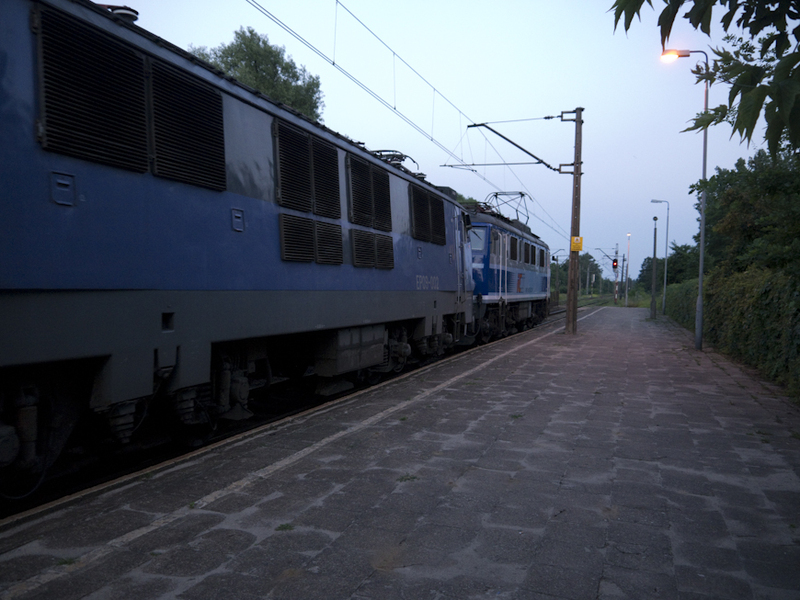 This Szczecin – Krakow train was already running 3 hours late by the time that it had arrived at Lodz Zabieniec. Krakow-bound passengers had a long night ahead of them. Photo BTWT. So, what is the way out for the fly from the fly bottle? More private sector investment? A new railway fund, backed by PKP’s property portfolio? Accelerated privatisation? The answer according to PKP S.A. is none of these! PKP has paid several million zloty to McKinsey who were commissioned to report on future options for Poland’s railways. Their conclusions? To prune some 2,000 – 9,000 km of ‘unprofitable lines’. Many railway professionals point to the futility of the UK’s search for ‘a profitable railway’ in the 1960s and 1970s and are disappointed that the opportunity is not being taken to adopt a more radical reform – to cut down and restructure PKP’s bloated and expensive bureaucracy. And now, specially for PKP S.A.’s strategic planners looking at cutting the PKP network to achieve the ‘profitable railway’, we have published a review of how – 50 years after the event – transport professionals now regard Richard Beeching’s Report, The Reshaping of British Railways. Beeching’s report led to the closure of some 5,000 miles (8,000 km) of the UK railway network, but failed ‘to make the railways pay’. Please see Beeching Revisited on our sister blog – englishrail blog.